Janet & John Tangney have been married for almost 41 years and live in Oregon. John's full time job is writing Computer Aided Design software, and Janet was previously a pre-school teacher and substitute teacher for high school special education class. While John is a photo enthusiast, Janet also enjoys the hobby. They primarily go to National Parks in the USA on their travels, and love the Northwest. John had previously gotten to go to Antarctica with Quark Expeditions, and hopes to be able to return to there with Janet in a couple of years. They have a website, www.pbase.com/jctangney where they post photos for all to view and enjoy. Janet & John Tangney embarked on Quark's 11 day Spitsbergen Explorer, Wildlife Capital of the Arctic. This Arctic paradise is perfect for first-time visitors. Below is Part 2 of the their exciting journey! Overnight the ship sailed back through the Freemansundet (Freeman Strait), south along Spitsbergen Island, around the southern tip and then sailed north to Bellsund Fjord. Bellsund is dominated by high peaks and rocky cliffs, interspersed with glaciers. The 1 km wide island of Akeloya separaes Bellsund from its two main branches, Van Mijenfjorden and Van Keulenfjorden Fjords and extends up to 80 km inland. We were sup-posed to land on the north shore of Bellsund at Van Mijenfjord, but due to wind and waves, switched to a south shore landing at a small fjord, Recherchefjorden (#10 on map). So, this was a fairly easy landing and return, unlike our previous landing. We hiked around on the tundra for a couple of hours, but other than a few birds didn't see any wildlife. Trappers built the structures that remain in the area in the early 1900’s. There are graves with crosses which have fallen because the land moves with the freezing & thawing cycle of the seasons. Due to the permafrost, the trappers could only dig shallow graves, so they were easy to dig up by animals. Overnight, we sailed out of Bellsund Fjord north along the coast of northeast Spitzbergen (island), around the northest tip of Spitzbergen and then into Woodfjorden (4th longest fjord in Svalbard) with plans to land on Worsleyneset, a promontory or small peninsula (#11 on map). A male polar bear was spotted on the shore be-fore we even got in the zodiacs, so we could only cruise around the fjord. We watched him walk briskly by 3 reindeer, but none of the reindeer seemed to care because they could easily outrun him. We would continue to see this same male bear as he made his way along the shore of the fjord. Once on the zodiacs, a second bear (a female) was seen walking along the shore as we moved further into the fjord. The guides can tell even from a distance if it’s a male or female by the size since males are really much bigger. Close up we could see that she had lost a radio collar recently, by the indent on her neck. Males are never collared because their head is smaller than their neck (or they just don’t have a “neck”). So a collar would just slide off a male easily. This female had a reddish cast over her fur. Actually her entire lower body is red. There is some mineral in the water that causes this. It’s easy to see the water line on her face and body. The zodiacs were following her from a distance. She walked along the shore out to the end of a narrow strip of land, stopped and laid down. The 8 or 9 zodiacs slowly moved in front of her as she closed her eyes. Occa-sionally she opened her eyes, saw those creatures in yellow jackets floating in front of her, then closed her eyes again. Not long after that that first large male bear approached the same area. He did not disturb her, although the guides think she was probably aware of him in the area. Our zodiac driver, Patrick, decided that the male would probably cross over the hill and we could zip around the hill on the water and catch sight of him again. He was right. The bear kept on walking but in a few minutes we again came across him and now he was approaching our zodiac. By now all the other zodiacs were mov-ing into position to watch him. He kept coming towards us and when he reached the water, he stopped, looked around at the zodiacs then walked into the water. He swam across the inlet, crawled out on the other side and proceeded up to the top of a ridge to shake the water off his fur, with a mountain setting behind him. John got a really good photo of him shaking. In the afternoon, we went on a zodiac cruise to the end of Leifdefjord (“love fjord”) to see Monacobreen, Monaco Glacier (#12 on map). Monaco Glacier was named for Prince Albert of Monaco who led expeditions mapping the glacier in 1906-1907. As we cruised through the fjord, we passed many smaller glaciers. It was like a giant cul-de-sac of glaciers coming down to the sea. Monaco Glacier is over 3 miles wide where it en-ters the sea. We watched a smaller glacier calving and road out the waves. Once a glacier calves, there's literally swarms of birds circling around the area looking for tiny sea creatures that have been stirred up from the ice that fell into the sea. Then all the ice that has fallen now clogs the fjord so it's a very rough ride in the zodiac making our way back to the ship. I took over 1600 photos (90% will probably be blurry due to taking them in a moving zodiac) today alone and that must have been a record for me. John took about 1400 photos. Also saw 2 walrus in the water and 2 Minke whales. Amazing scenery, glaciers and mountains surrounding the entire fjord in all directions. As we returned to the ship, it started sprinkling. It's now raining hard. 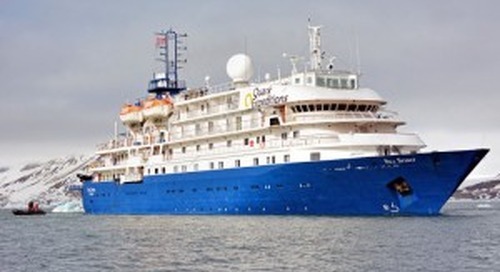 Anoth-er zodiac cruise is planned in 2 hours in front of a glacier. Tonight at 10pm we passed the 80 degree North latitude (#13 on map) and we had a BBQ out on the top deck. We were wrapped in our yellow parkas huddling together to keep warm. Our ex-pedition leader, Woody, wore Hawaiian shirt with no parka! Off the port side of the ship as we celebrated crossing the 80 degree point, we saw a walrus “haul-out” on a nearby shore. From the collec-tive gathering of warm walrus bodies (at least 50) combined with the right atmospheric conditions, we could see steam rising from the haul-out. So we are sailing near the ice pack in this as we sail southeast through Hinlopenstretet (Hinlopen Strait) to-day. This strait lies between the islands of Spitsbergen and Nordaustlandet. We haven't seen this kind of ice until today. Up to now, we see icebergs and some sea ice, but this is like puzzle pieces all floating together as it continues to break up along with icebergs, which have calved from glaciers. In the afternoon, we did a zodiac cruise past the cliffs of Alkefjellet on Kapp (cape of) Fanshawe also known as “Mount Guillemot” in Hinlopen Strait (#14 on map) which is the breeding site of 60,000 breeding pairs of Brunnich’s Guillemots. Several species of other birds also nest there in the summer. There is an estimated 250,000 breeding pairs of all birds here for 3 months of the year. The Guillemots fly and swim like pros, but water take offs and landings are hilarious. They glide down low and after a while then just flop ungracefully into the water. Takeoffs are running across the water while flapping furiously taking a long time to actually get airborne. They frequently collide with others attempting to either land or take off. We watched a Great Skua (a large sea gull type bird) tackle one of these little guys, hold him underwater to drown him, all the while other Guillemots were swimming by glancing casually at the take down or just swim-ming by the ensuing murder without even taking notice. Even for those of us who don't fully appreciate birds, it was an amazing site. Backtracking now, north of Spitsbergen Island overnight, we headed south into Smeerenburgfjorden, Smeerenburg Fjord (#16 on map), on the northwest corner of Spitsbergen. John and I opted out of the zodiac landing this morning on the small island of Amsterdamoya. It's all about the whaling settlement in this area in the 1600's, not our thing. John is work-ing on photos that he wants to submit for the DVD which is a collection of photos that passengers could submit, then everyone gets a copy of it. Tonight is the end of submitting photos. I saw 3 puffins fly by me Monday morning. I was just headed in the door, so I couldn't get a shot of them, but I said it to the few people sitting in the lounge. I didn't see any more, so I asked one of the staff if I really could have seen puffins. He said there aren't many here right now, but yes, I probably did. I was bragging that I must have seen the first puffins on the trip, but people from England told me that puffins are all over the coastal areas of Great Britain. Oh well! After lunch we went on a zodiac cruise from Smeerenburgfjorden (#16 on map) to Fuglefjorden, Fugle Fjord (#17 on map) , exploring the glaciers and looking for wildlife. This entire area is part of Nordvest-Spitsbergen Nasjonalpark, Northwest Spitsbergen National Park. We saw glaciers calving, lots of sea birds, including Common Eider Ducks (I got great photo of that) plus puffins. John got a really good photo of a pair of puffins. It is amazing to think that for nearly 3 months, it never gets dark. But then even more amazing to think that this area is in total darkness for the same amount of time. This whole adventure will be ending in 2 days. I will be glad to get home (I miss petting a dog.) But will be sad to see this end at the same time. We sailed at night south along the northwest corner of Spitsbergen then rounding the tip of island, Prins Karls Forland, for a landing at Poolepynten on that island (#18 on map). We are going to see a walrus haul-out this morning on a zodiac landing. John is standing in line to be on the first zodiac out (they usually have 8 zodiacs). We saw a haul-out from a distance at the 80th latitude party. But, hopefully, we will be closer to the haul-out doing a landing. The first group of passengers from 3 or 4 zodiacs will approach the walrus. How they react to us will deter-mine how close we can get. In other words, if they freak and head to the water, at least we will be in the first group to try to see them. They announced all this last night, so I have a feeling they know well how this will play out. They give the worst case scenario, but expect it to be fine. They were quite sure the walrus would be in this location. This is our final zodiac landing so I'm sure they want to end on a high point. I read when we boarded the ship last week that email would end 2 days before we return to Longyearbyen. We have about 24 hours left on board and I'm still emailing. So this may be my last email. I hope not, I would like to write about the walrus when we get back to the ship. Just got back from seeing the walrus and still have email up and running. Apparently 95 creatures in bright yellow parkas are not enough to disturb a mid-morning nap on the beach for a couple dozen walrus. The crew set out a line in the sand so the passengers would know exactly where to stand. It was 30 meters from the walrus (I haven't done the math yet to convert it to feet.) There were a few scuffles within the group, much to the quiet delight of all of us. There was no steam rising from the gathering as the air temp was warm enough for that not to occur. It was quite a privilege to stand there observing those large lumbering animals. Lunch in a few. Gotta get in line. This will be my last email from the ship. After our walrus encounter this morning, we sailed south into Isfiorden (the fjord where Longyearbyen is located) to a landing on the north side of the fjord in the bay of Trygghamna below the mountain, Alkhornet (#19 on map). Our hike was through lush, often times, soggy tundra and up and down steep hills. The cliffs around our land-ing site were bird colonies and we were told that reindeer frequently graze in the area. The highlight of the hike was seeing 3 beautiful reindeer close-up. It's hard to take seriously an animal with the name "reindeer". They are quite beautiful, but they have this weird black mask across their face making sort of comical looking. We hiked up, way up, to see them. Not everyone made it. I'm quite proud of myself for doing it. After our photo session with the reindeer, we started our walk back. Annie, one of the guides, pointed out the native willow trees now have leaves on them. In another month they will be sporting their fall colors. These trees are no more than a half-inch high. Technically they are trees, but it's hard to get excited over a fully grown tree that's less than an inch high. Speaking of trees, it has been 10 days or so since I've seen a tree or any plant that's over a few inches high. We do not have far to travel to get back to Longyearbyen (#20 & #1 on map), so will stay in the Isfjorden to-night, then finish our journey early in the morning. We will use zodiacs to get to the dock in Longyearbyen as there are not enough docks to accommodate all the ships that arrive in Longyearbyen. Tomorrow it's back to the airport run. We'll be home Friday night. I hope you enjoyed reading my emails. I en-joyed writing them. When John went to Antarctica, it was so fun for me to get his emails. When he got home, I took the emails and made a journal of his trip inserting the appropriate photos with the emails. Thought for the day: I have heard only 3 phones ring over the past 10 days. It's probably a communication system within the ship. The phone in the bar rang once and I head a phone in the kitchen area of the dining room a couple of times. It will be back to the world of rings and beeps tomorrow! John has all our photos (probably 5000 for each of us) downloading as I type this. Yes 5000 each is extreme, but MOST of them are blurry (at least for me) because we were taking most photos on zodiacs! I do have a few photos that I took on my little Canon camera. These were from our Arctic BBQ, crossing the 80 degrees north celebration (#13 on map) and hat contest on the 30th. John and I did not enter the con-test. Temperature at the BBQ was probably about 40 degrees F with a brisk wind. The day we disembarked from the ship and waited in Long-yearbyen for the airport bus, a group of high school age kids from Longyearbyen Skole (primary and secondary school) walked through the city center. One of the stu-dents, Tim, had his husky, Spot, with him. I think this might be a daily occurrence, since all of them seemed to take delight in watching dog-owning tourists, who haven’t petted a dog in many days, take turns petting Spot. I wished I had Googled this before we left on our trip, as this is really interesting about Longyearbyen. (I never study up where we are going until I get back.) I would have thought the name, Longyearbyen, would have something to do with the long days for 4 months in summer when the sun does not set or the long nights for 4 months in winter when the sun does not rise. No... John Longyear, an American, started the Arctic Coal Company in 1906 employing 500 hearty men. The settlement was known as Longyear City. Today it is Longyearbyen. Coal is still mined there today and the city buzzes year-round with tourists. Winter is for snowmobile tours of the tundra, exploring ice caves and viewing the Northern Lights. It is the world's northern-most town and the northernmost settlement of any kind with greater than 1,000 permanent residents. And finally, remember John’s photo of the reindeer won the first "Photo of the Day”? That photo won “Photo of the Voyage”. The prize was a DVD with a 1000 images of the Svalbard region taken over several years by one of the Zodiac drivers, Vladimir Seliverstov. John remembered Vlad from his trip to Antarctica in 2010. Gorgeous photos! 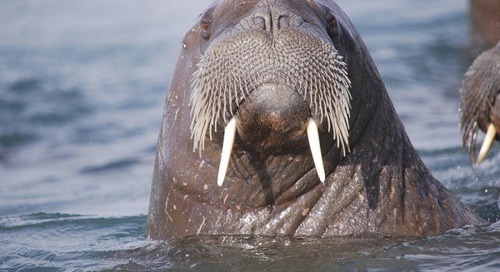 10 things you didn't know about the walrus!